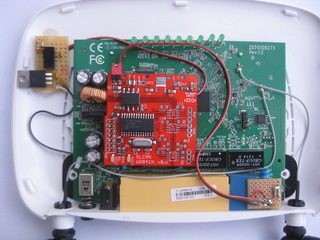 This site describes a CAN interface directly connected to the JTAG header. 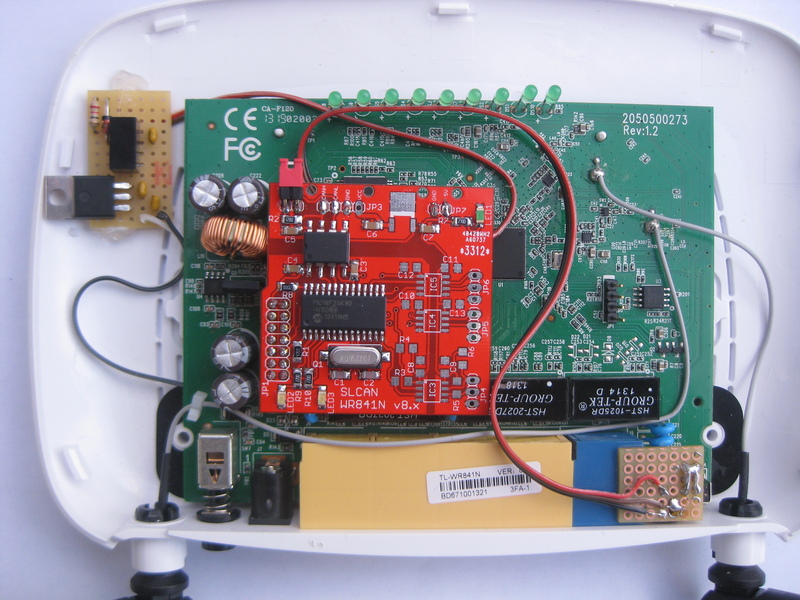 The OpenWRT images includes all bins to build up SocketCAN interface - except the PIC firmware which needs to be loaded externally due to different licensing. The heart of the interfac is the PIC18F25K80 (PIC18F26K80 works also) which translates the CAN to serial data (SLCAN) and vice versa. 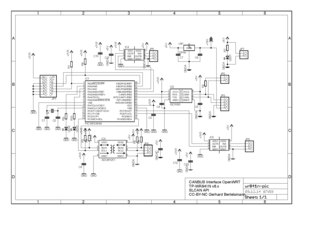 A TI ISO1050 tranceiver connects the PIC to the CANBus. Due to the glavanic isolation you need to provide an external 5V source or use the build in 7805 linear voltage regulator and feed it with a 7V to 30V source. IC3 to IC5 are not needed for the CANBus - they are for future use. Installing the 14 pin header on the router is a little bit tricky - I use a medecine needle with a 0.9mm diameter to get rid of the solder. Heat up the pad from the buttom with your solder iron (min 60W) and put the needle from top carefully thru the hole while twisting a little bit. The PCB also needs 3V3 - you can find it on the back at TP1. 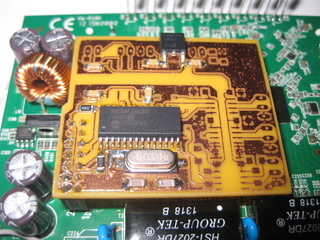 Use a wire and connect it to pin 14 of the JTAG pin header. The firmware (500kBaud UART 250kBaud CAN) is licensed under CC BY-NC-SA 4.0. 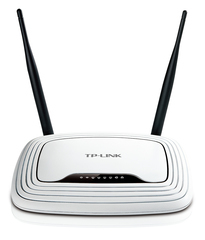 This is different to the OpenWRT GPL(2/3) so it can't be included. You only need to programm the PIC once. After every restart the setup it done autmatically (TODO: not ready yet). shows any traffic on the CANBus. There are other tools included like cansend, cangen, and canbusload (slightly modified for microsecond resolution) from the CAN-Utils. can2eth shows how easy it can be used. The code takes CAN frames and generates network packets and send it to the broadcast address on UDP port 7654. 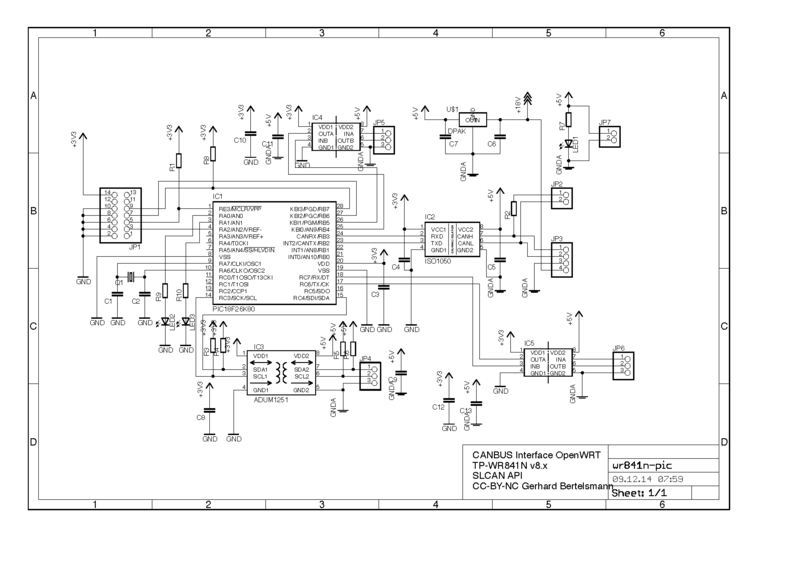 The other way arround there is a UDP socket on port 7655 will accept network packets and put it on the CANBus. There are many sites (like these on my server here) describing the use of Microchips MCP2515 SPI CAN controller. The MCP2515 works fine - in fact there are some quirks but they are described in the Erratra. But the SPI interface is a challenge for an OS like Linux. Normal OSes don't guarantee response time to exceptions like the interrupt form an external controller. Due to interrupt latency there might be CAN frames interchanged or lost or more worse the kernel module might hang. MCP2515 SPI interface is able to work at 10MHz - this looks enough to serve a CANBus even at 1MHz, but to get a single CAN frames out of the controller you have ask for the buffer where the CAN messages is saved first. So you need to setup some SPI sequences. The Linux kernel does have a fancy SPI driver using work-queues. But this increases the latency even more. SPI sequences might wait for a long time. For using SPI a hardware SPI is recommend. The AR9341 SoC on the WR841N v8.x provides a hardware SPI interface, but it is shared with the flash. Any access to the flash memory will increase the latency even more. The approach described above is different: The PIC MCU receives CAN frames and sending it directly to the UART. The controller does not need to wait until the host request the data. So the PIC buffers are cleared immediatly. The build in FIFOs of host systems will buffer the packets and that leads to better performance even with the ASCII overhead. CAN-CAN was written by Darron Broad in assembler and is greatly optimized. The code is able to translate more than 5000 CAN frames (test with extended frames and DLC8) to ASCII every second - this is more than a completely 500kbaud saturated CANBus would carry. This ouperforms many selfmade adapters and even some commercial ones.